Chelsea made a dismal start to their Premier League title defence as they fell to a 3-2 defeat by Burnley that featured red cards for Gary Cahill and Cesc Fabregas. Cahill was sent off by referee Craig Pawson after only 14 minutes when he ended Steven Defour's run with a high tackle that was clumsy rather malicious. Even when a man down Antonio Conte could not have predicted the capitulation that followed as Burnley stormed 3-0 ahead through two goals from Sam Vokes and a terrific strike by Stephen Ward. Assisted by a woeful home defence, the underdogs were out of sight by half-time and although Chelsea dominated the second-half with Â£58million striker Alvaro Morata on target, they had left themselves too much ground to claw back. Fabregas was given his marching orders after receiving two yellow cards but, despite being reduced to nine men, the champions added a second through David Luiz that at least highlighted a level of desire that was missing before the break. Former England captain Alan Shearer had said of Chelsea that there is "something brewing which isn't nice" and their first-half implosion in a thrilling match would appear to give his view credibility. Conte is reported to be unsatisfied with the club's transfer activity and his lack of say in the recruitment process, and on the evidence of his team's early disarray at Stamford Bridge the problems extend on to the pitch. It began to unravel before the quarter-hour mark when Cahill was shown a straight red card for his lunge at Defour before Fabregas was booked for sarcastically clapping Pawson. Temperatures rose as furious home fans jeered the referee but their taunts were directed at Burnley's supporters shortly after when Vokes had a goal disallowed for a foul in the build-up. The pendulum had swung in the wake of Cahill's dismissal and in the 24th minute Vokes propelled Burnley ahead when he steered a cross by Matthew Lowton into the net. It was a scruffy shot that beat Thibaut Courtois and the Chelsea keeper had every right to feel aggrieved with Luiz, who turned his back on Vokes as the ball arrived. 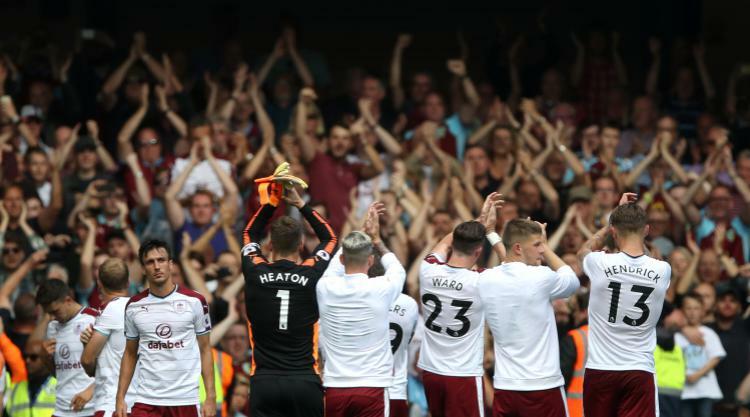 Sensing the opportunity before them, Burnley continued to press against opponents who were creating nothing in the final third and in the space of four minutes before half-time they had powered out of sight. Ward delivered a stunning shot from a tight angle for the second, but having been played in by a one-two he was allowed into a scoring position far too easily with N'golo Kante enabling him to escape. And Chelsea waved the underdogs through for the third as an unmarked Vokes met Defour's sublime cross with a unstoppable header. Conte's men were in danger of making a dire situation worse when Luiz took exception to a tackle and touched heads with Robbie Brady before shoving him. Pawson kept his cards in his pocket on this occasion but he was accompanied by a protesting Luiz as they departed the pitch for half-time, although the Brazilian's anger should have been directed at Chelsea's defensive shortcomings rather than the officiating. The Blues played with far great purpose after the interval and Willian had a free-kick dabbed over the crosbar by keeper Tom Heaton. Conte gave new signing Alvaro Morata his debut and one of the Spain striker's first involvements was to be clattered by Ben Mee, whose hard tackle earned a yellow card. His next contribution was far more pleasing, however, as he timed his advance to perfection to nod home Michy Batshuayi's ball from close range. Morata had a second disallowed for offside before Luiz stabbed home with seven minutes of play left. Burnley hit the post with a free-kick and the match ended with yet another surge from Chelsea who had run out of time to complete their fightback.